Experience what we're making "behind the scenes" in our small-production, limited releases of over a dozen exclusive "club only" wines. This membership level offers two monthly selections of either reserve, pre-release, library, or "club-only" wines, automatically billed at $55+tax. Selections vary by season. For only $3 extra per month, we'll select ONLY red wines for you. Sometimes we'll "double you up" on the special red for that month - other times, you'll get exclusive access to otherwise unavailable bottles of red wines. For only $5 extra per month, we'll select ONLY sparkling wine for you. For $3 less than the "standard" membership, we'll select ONLY white wines for you. Sometimes we'll "double you up" on the special white for that month - other times, you'll get exclusive access to otherwise unavailable bottles of white wines. So…what is the “Wine Club”? Two bottles of specially selected wines at one heck of a price - a flat $55 (+tax) - specially allotted to you every 4 weeks (13 shipments/year). Want extra wine? Boom. Place an order for any assortment of twelve (12) or more bottles, and the wine is half off. That's right: 50% discount on orders of 12+ bottles (mix and match allowed). No catch, no commitment*. Here's the deal: this club rocks. No other club is like this club. We deliver to you the best wine we can make, at prices you can afford, and offer you the space in our winery (and the complimentary glasses or tastings to go along with it) where you can bring your family and friends to enjoy spending special time together. Relax. It's the perfect activity. Have your wines mailed, or have them held for pickup - and we'll hold your wines for pickup FOR UP TO A YEAR. No fees, no fuss - and yes, you read that right: we'll hold your wine for you for more than a year! Just come get them when you can. Older vintages may be replaced and substituted with whatever we have that is most comperable after three months. Find THAT at another winery! Shipping is flexible: are you planning to visit the winery? Email us ahead of time, and we'll hold the upcoming shipment instead of mailing it. Prefer to have the wines shipped every 3 shipments instead of the week of each shipment? No problem - save on shipping, and we'll bundle them together. Have your wines being held, but need them for a party? We'll box up whatever is waiting for you and ship it out (small shipping fee according to amount of bottles you have waiting). Bringing friends? Complimentary tastings...or glasses...included! ** It's your time to shine: each membership includes a complimentary wine tasting or complimentary glass of wine for your membership (2) and up to four (4) guests...that means any party of 6 is complimentary when you come to visit. ** Plan on bringing more? No problem - additional guests may join you for a small fee. Wine club parties of 5 and more are accomodated in the wine club Barrel Room. The upstairs lounge areas are reserved for groups of 4 and less. Wine club benefits can only be used when the member named on the account is present. – John Delmare, Owner, Rappahannock Cellars. Be part of an exclusive community at Rappahannock Cellars – an establishment that is truly Revolutionizing Virginia Wine. *Two bottles of specially selected Rappahannock Wines will be billed every 28 days (four weeks exactly) at a flat rate (varies by membership type) to a credit card of your choice. The week that this charge will occur is always listed on our event calendar. The wines will be delivered to your home / office (+$13.75 shipping/handling to Virginia, varies by state)– or you may opt to save on shipping and pick your shipments up at the winery (we’ll hold the wine for you until it’s convenient for you to visit and pick it up for up to 13 months; shipment-to-shipment retrieval is not necessary.) No refunds will be issued for the charged wine club shipments. 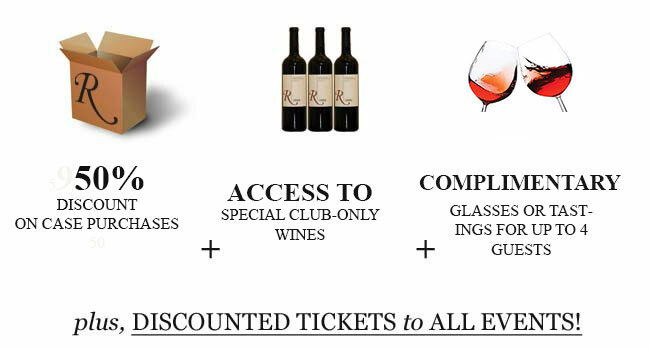 There are no other fees associated with the Wine Club membership. Although no commitment is required, we encourage you to remain in the wine club for at least one year to experience everything that the wine club has to offer. ***Membership benefits are non-transferable and member must be present for all account activity. ** Member benefits are extended to guests for first visit. After first visit, guests should establish their own memberships in order to continue to take advantage of wine club benefits. ***Want to make a change on wines that are going to be shipped to you? No problem, just send us an email and let us know what you'd rather receive instead. Please note that any modifications to your club shipment (for wines that will be sent via FedEx) must be received by 5pm on Wednesday of the "shipment week" (this week is always going to be noted on our Event calendar on our website, as well as mentioned at the bottom of your pre-shipment newsletter). ****Waitlist Policy: Our wine club is now reaching maximum capacity, and when the club has become "full", new membership applications will be added to a waitlist. In order to secure your spot in line, you must sign up for the club and purchase your first shipment. Once space has opened, you will be notified and added to the wine club, and full membership benefits will be made available to you. Once in the wine club, you must maintain active status by receiving all the consecutive club shipments in order to maintain your place in the wine club. If for any reason you cancel the wine club, put your membership "on hold", or otherwise lapse in activity (cease accepting the consecutive shipments), your space will be offered to the next person in the waitlist. If this happens and you wish to renew or rejoin, you will be added to the waitlist and your membership will be resumed on a first-come, first-served basis of availability. Shipment Selections may be swapped out for other wines of equal or lesser value; no refunds provided; for more expensive wine selections, we will charge the difference in bottle price when a more expensive substitute is chosen. Club Room Policies: Wine club rooms have been reserved only for wine club members! There are 3 designated wine club areas: (1) upstairs front club room (2) upstairs back club room (includes member's deck) and (3) the club barrel room. Friday-Sunday the upstairs’ club rooms (1 & 2) are reserved for groups of 4 and less. All large groups are accommodated in the club barrel room (3) on the weekends*. A 'library atmosphere' is required in the upstairs club rooms and we ask that every member helps us to maintain a peaceful and quiet atmosphere. Prefer to be more festive? Everyone is welcomed in the barrel room (normally filled with live music) not just groups. Children are welcomed in our winery! Please be aware that a child does count as a person in your group size. We want to make sure everyone is safe while at the winery and children must be attended and within 25 feet of a guardian. Running and horseplay is prohibited indoors for safety purposes. *Barrel Room is open Sundays and Saturdays. Upstairs club rooms are opened Sunday-Saturday and there are no group size limits Monday-Friday. Cancellation: we require written notice 30 days in advance (email Teresa at club@rcellars.com) for wine club cancellations. We will bill for any shipment scheduled to occur within thirty (30) days after the date a cancellation request is received; no further billing will occur thereafter. Once discontinued, please pick up any wines not shipped within 60 days, or the wines will be returned to inventory and no refunds will be issued (unless other arrangements have been made). If we have not heard from you in 6 months and/or your credit card has been declined for 6 months (even if you have not requested a cancellation), then your membership may be automatically put on hold, and your wines returned to inventory - no refunds will be issued for wines returned to inventory for account delinquency.